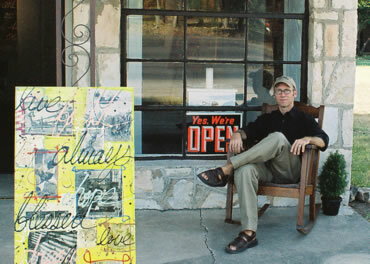 Such was the light of longtime downtown Austin gallery owner and art scene denizen Robert Ellis Patterson, whose twin flames met at the center of his candle on November 19th, flared into a single brilliant aurora, and vanished forever from the world that can be seen through mortal eyes. Everything Bobby did was a testament to that deeply felt conviction. As a friend and as a lover of Mankind, he was unsurpassed. He will live on in the hearts of many (some of whom knew him not so well as others) for his uncanny ability to make anyone in his presence feel that he or she was the most welcome and important person in any given room. Originally from Lubbock, Patterson was himself a lifelong visual artist as well as a tireless promoter of others’ art. In Lubbock, Patterson was also a fearless and exuberant performer, both on the theatrical stage and fronting the legendary Lubbock band The Rude Boys. After attending the School of American Music and Dramatic Art in New York City, Patterson continued to hone his skills both as an artist and a promoter of artists during his tenures at several prestigious Manhattan contemporary art galleries. In 1997, Patterson curated “Wet Paint,” a group show of paintings at the Mary Anthony Gallery in New York City. Returning to Texas in 1999, Patterson found his home in Austin in 2000. 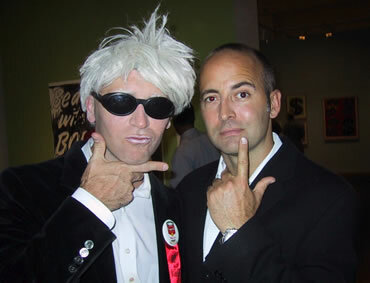 In 2001, he opened the Austin Modern Gallery, a venue that will live forever in the memories of those who knew and worked with him not only for the exposure Patterson gained for a talented cadre of emerging and nationally-known (but unknown to most of us in Austin) artists, but – almost as importantly – as a magnetic epicenter of the Austin social and arts universes. Recognizing immediately the building excitement of the nascent downtown revitalization gaining momentum at the beginning of this twenty-first century, Austin Modern was one of the first businesses located on the retail level of Post West Avenue complex at West Avenue and Third Street. Always one to relish the opportunity to be in the thick of that which was new and exciting, Patterson knew that the then-underinhabited retail and residential complex would soon become a hub of the progressive, urban-oriented spirit prevalent among Austin’s cosmopolitan core of young professionals who would soon catalyze a citywide effort to create a genuine, thriving community in downtown Austin. 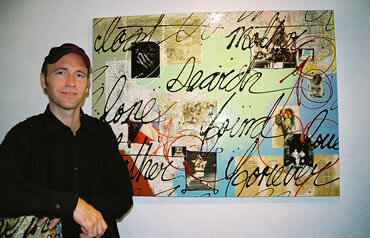 The Austin Modern’s inaugural show, featuring the work of Dallas artist Christopher H. Martin, was an immediate success. Patterson, thriving on the budding synergy of the emerging Third Street gallery scene, often coordinated his events with those of his gallery neighbors, Gallery Lombardi and the Tate Gallery. The result of this combined effort gave birth to informal Art Nights, during which patrons, friends, and passersby could stroll the neighborhood, have a glass of wine, and enjoy both the abundant art and the company of others who appreciated the efforts of those whose mission it remains to bring art to the people of Austin. “Austin Modern is the kind of place where people can drop by on the weekends or during lunch, have a cup of coffee or a glass of wine, take in the art and enjoy the trains passing on the nearby tracks,” Patterson said. I have always admired the work of the New York School of abstract impressionists – Pollock, DeKooning, Motherwell, Kline, Rothko, and others, but I never knew how I could interpret such passionate American painters. One day, I dripped some words upon a painting that I meant to destroy. It became a new direction for me, and has been the focus of my work ever since. I am interested in words and in their abstract meaning. It is hard to say the truth, and sometimes hard to hear it. I try to tell the truth in my paintings, and yet let the paint tell its own story. I hope that the meaning of the work will come through without my having to spell it out. I put all of my heart into the paintings, and feel deeply about all of them. Whether a song, a sonnet, a poem, or picture, they are all moments and memories that are captured on canvas. I hope that you will enjoy the work, and find the meaning of them in your own way. The works, anchored by the decoupage of classic graphic and photographic images, are enhanced and rendered unique through the over-painting of universally meaningful language applied in Patterson’s lyrical, calligraphic hand. As with the axioms that guided Patterson’s relations with others, the language found in the works of the Inspirational Abstraction series holds true to the spirit that guided both the art and life of Bobby Patterson. 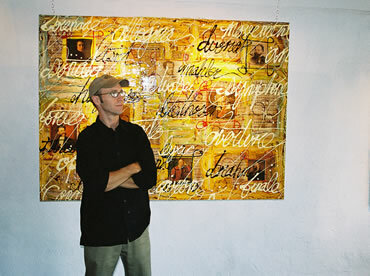 Words like “love,” “always,” “blessed,” “together,” and “forever” are recurring motifs in the paintings of Bobby Patterson. To those who knew him, the presence of such language comes as no surprise. Patterson’s own work had, at the time of his death, matured exponentially, no doubt the result of the peace he had recently found within himself and through the love he shared with his fiancée, Kirsten Orr. Robert Ellis Patterson is also survived by his parents, Jeannie and Tommy Patterson of Lubbock, brother Eddy Patterson of Austin, and a legion of friends who are, to this day, howling at the moon. For all inquiries, contact Eddy Patterson at (512) 426-9993.